This guide is built to give you the steps to get the predictable and consistent online visibility, traffic and prospect conversion your law firm needs to grow. We’ll explain how a digital marketing engine should really work, and how it can be modeled successfully for attorneys. What does the number $119,000 mean to you? According to the Bureau of Labor Statistics, in 2017 that was the median income for lawyers in the U.S.
How do you get business now? The biggest difference between the average earners and high earners is simple: one group relies on referrals, and the other group leverages online marketing for law firms. Part 1: Be where prospective clients are looking for your services. Part 2: Give prospects what they need, so they choose you when they’re ready to retain a family or divorce law attorney. We live in a time where consumers overwhelmingly use Google to search for services and for answers to their questions. This applies to attorneys, as well. So, you must be present where and when prospective clients are looking online, which is primarily Google. Maybe you’ve already been on Google and didn’t get the results you wanted. But it only works if it’s done right. 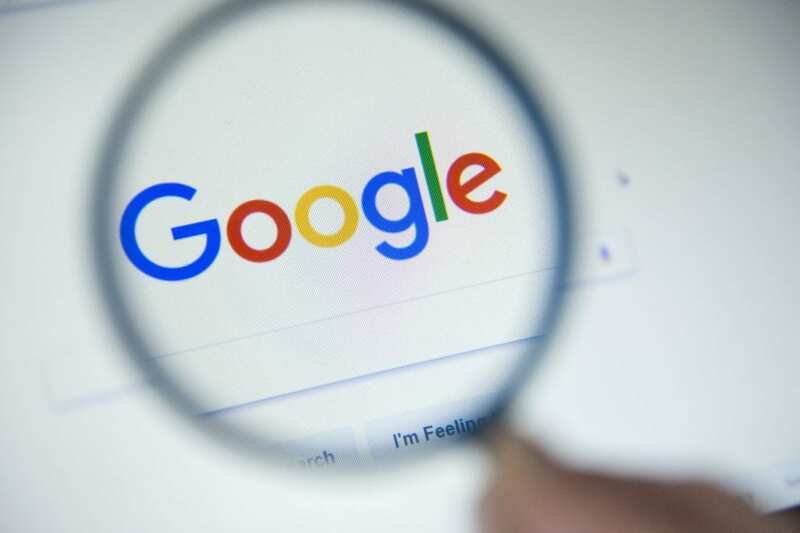 Google dominates search with 93% of market share between online search engines, and with the volume of daily searches the opportunity there is real. Yes, these are monthly stats. How many of these people came to your website and became your law firm’s clients? Start with a simple exercise. Look at competing firms in your area, as well as bigger national firms, by performing searches similar to the services you provide. Those are the firms who are getting in front of prospective clients where they’re looking. The next step is to do what they do, but better. Now we’re going to explain Google visibility in three parts. First, Google Ads. These are the top 3 or 4 links in Google search, and they’re paid spots that advertisers bid on. You don’t have to spend $70,000 a month like our research indicates CordellCordell.com does to get there, but you do need to talk to a web design and digital marketing company to optimize how you should bid and for what keywords. Google Ads pop up according to what a user is searching for, so you want to bid on keywords that bring in the prospects who really need your services. Next, the local results. These are the local “map pack” results that show up second on the Google search page, right below the sponsored ads. You’ve seen this map a million times, with its red dots littered across a location. Click on any of those dots, and a box will appear with information about the location or business. There are also “best result” links that Google displays prominently on the bottom of the map pack. 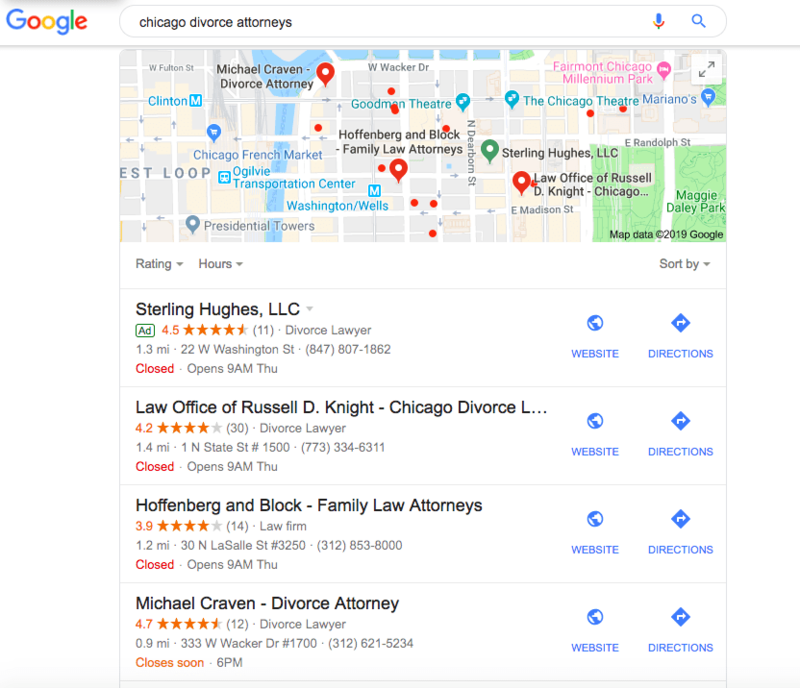 There are many strategies to boost ranking in the map pack, but for now start by optimizing your Google My Business listing. Then, we can talk you through more law firm SEO services that can lift your local ranking even more. Finally, the organic results. This is the list of links under the Google Ads and the map pack. And despite sitting below those other search results, almost 80% of clicks go to these organic results. And of those clicks, roughly 30% go to the first link, then 15% to the second, then 7% to the third. Not only do you have to rank in organic listings, you have to rank as high as possible. We’ll get more into some specific strategies in Part 2 of this guide, but in basic terms, to boost your organic ranking on Google you have to offer information and answers for the questions people are asking in Google search. 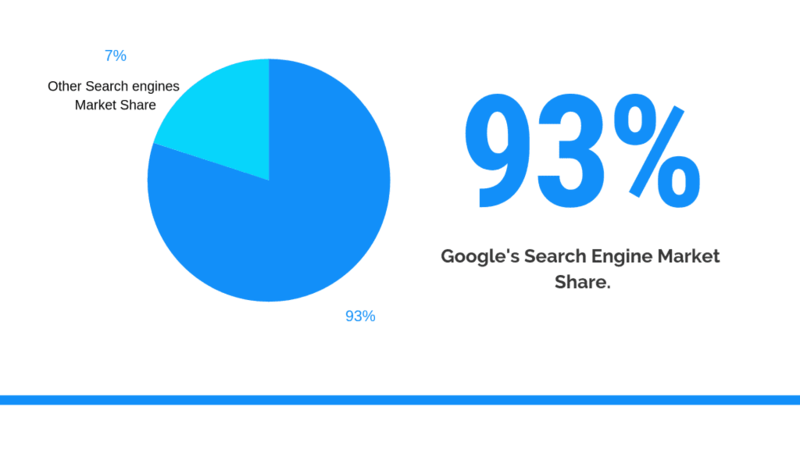 Do you remember those search statistics we listed? 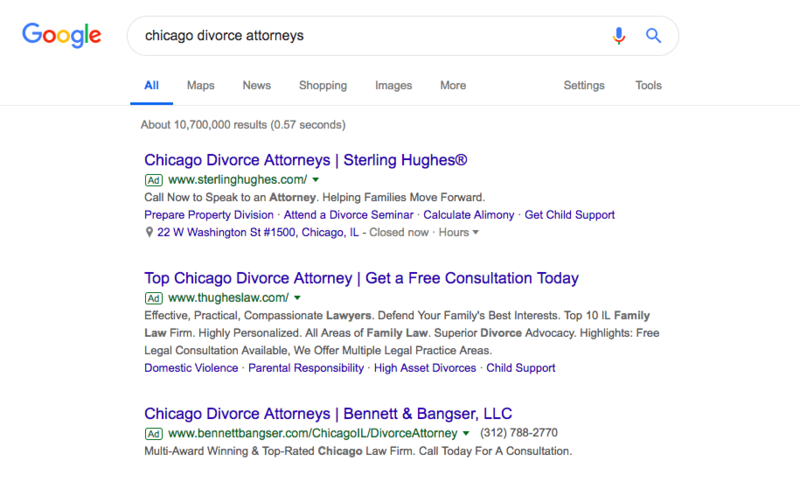 They’re not just searching for “local family lawyer” or “divorce attorney near me.” Those are also prospects asking specific questions about things like custodian rights, who should pay child support, etc. Another place you need to be is on online directories. 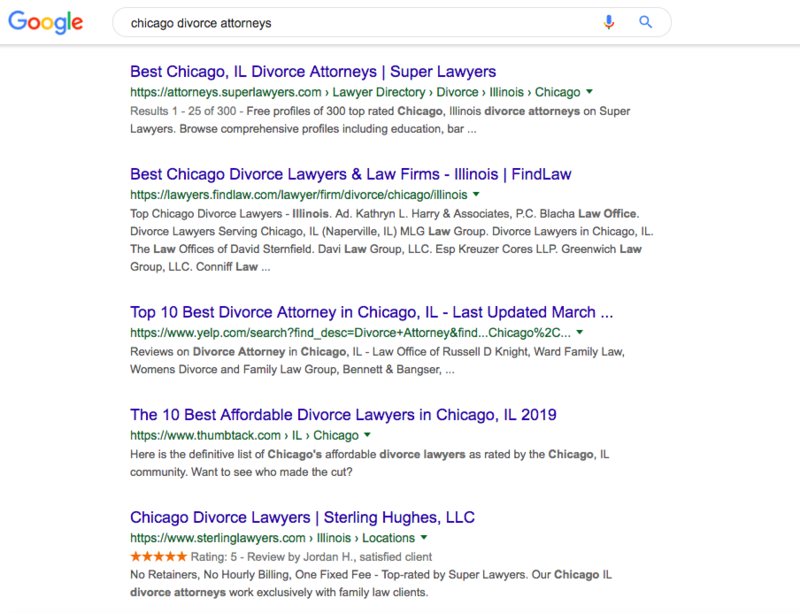 Google and Yelp are popular options across all industries, but there are also attorney-specific directories like Avvo and SuperLawyers. First, make sure your profiles on directories are all set up or “claimed,” meaning you have full edit access and know exactly where your law firm is listed. You can also add photos, ensure contact information is up-to-date, add bio info, practice areas and more. Take a look at the steps Podium recommends to optimize your directory listings, because you’ll want each profile in good shape before this next step. Next, talk to your digital marketing agency about appropriate budgeting for a sponsored placement on a directory. Sponsored listings on directories show up first in directory searches. This is essential on a directory with hundreds or thousands of attorneys and law firms. If you aren’t showing up on page one of an online directory, you might as well be invisible. According to Yelp, 80% of the searches done on their directory are on a mobile device. These users are on-the-go and won’t look past the first page of search results, according to the same Yelp Factsheet. YouTube is the second largest search engine on the web (after Google). There are billions of questions asked on YouTube every month, and therein lies the key—people use YouTube to ask questions. When we say you have to be on YouTube, we mean you have to be there to answer your ideal prospects’ questions. Today, 67% of the buying process is done online in the investigation before any call is made. 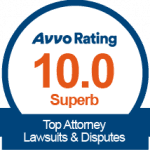 Especially with the family legal problems your prospects are facing, they want information and answers before they so much as look at a lawyer’s website. Now, how do you get on YouTube and use it to that end? Start with a pen and a pad of paper. You get calls and field emails from prospective clients every day, and they always include at least one question. What are the common questions those prospects are asking? What are the things prospects always want to know? As calls and emails come in, start writing down all the questions prospective clients ask. Once you have 30, 40, 50 questions, buy yourself a $20 tripod and a $50 mic. Those two items, plus your smartphone, and you have a ready-made studio. Then set aside some time, hook your phone onto the tripod, and record answers to each of those questions one by one. Then, post those videos to YouTube. Now when prospects look for an answer to those questions, they can find you. And after they find you, the chances that they’ll believe you can solve their problem are far higher—along with the chances they’ll contact you when they’re finally ready to talk to an attorney. Your YouTube presence is about trading a little effort for a lot of visibility. And that visibility will lead to prospective family law and divorce clients for your firm, which ultimately leads to more cases. So, let’s say you’re listed in Google Ads, in the map pack, and in organic search results. And you’re also listed in directories, and your YouTube channel is up and running. You are where your prospects are. Where do they go next? Your website. Most attorney websites are failing in just about everything they set out to do. The average conversion rate for websites for lawyers is about 1%, half of the already-low web average of 2% across all industries. But smart web design for attorneys (Best Law Firm Websites [2019 Edition]) turns a law firm site into a high-performing tool for real growth (high-performance sites defined by 10% conversion rates). Maybe web design doesn’t sound exciting to you, but if someone arrives at your website and it looks poor in comparison to other law firm websites they’ve visited or will visit, that prospect may be calling another attorney – the one that appears more successful and professional – in a matter of seconds. Your website’s visual presentation is the first thing that needs to capture your prospects’ attention. 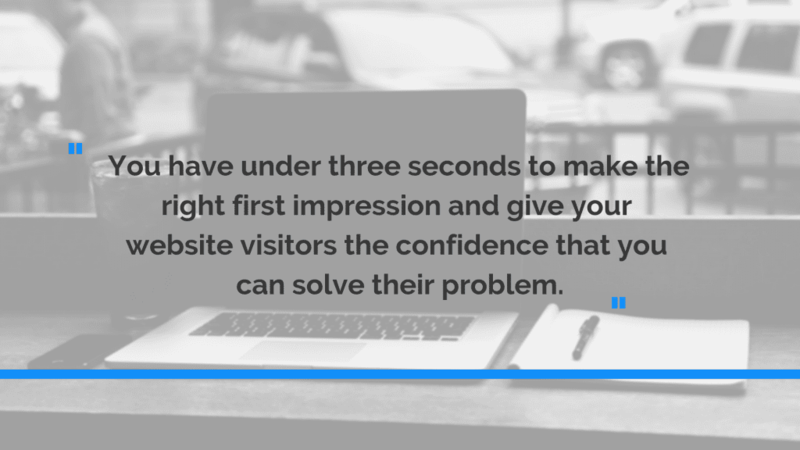 You have under three seconds to make the right first impression and give them confidence that you can solve their problem. Visual presentation. Is your website attractive? Is the first thing visitors see something they can relate to, something that pleases the eye? Or is it a frowny-face photo of a lawyer in front of a legal library? Look at the best websites of your competitors and build off of what they do well. Get ideas and then do it even better. This is what makes your website’s design competitive. Explain what you do. Make it clear what problems you solve, because that’s what prospects have to know up-front. Your site’s navigation also has to be easy to understand (consider listing “problems we solve” instead of “practice areas,” for example). Any idea that can more simply answer the question “what can you do for me” for prospects will be a good idea. When people look for a family law or divorce attorney, they’re facing a problem that’s made them feel vulnerable. There are sensitive pieces of their life on the board, and they’re looking for help that makes them feel confident again. You need to speak to prospective clients on a human level while assuring them that you are proficient and can solve their problem. This is the crucial step that will convert the prospects who are ready to seek legal counsel now. These are the people who are googling “family attorneys near me,” and who are ready to call the first lawyer who inspires their trust and confidence. 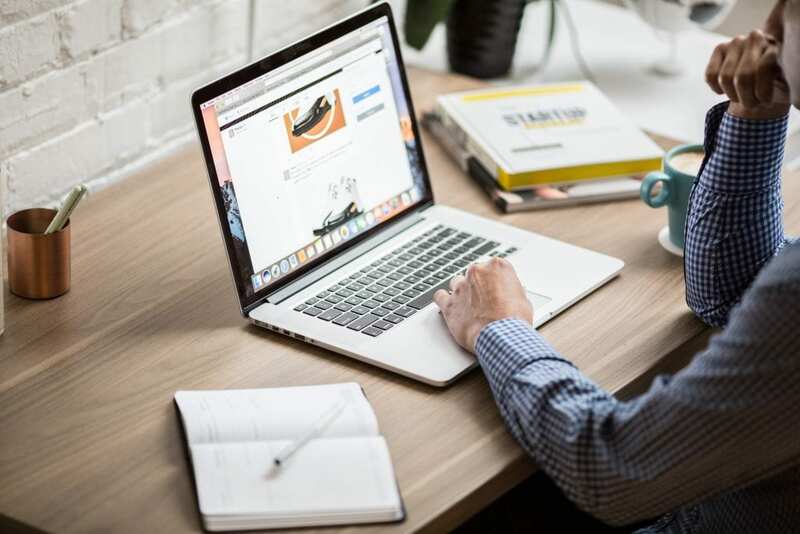 Around 70% of cases going to the first lawyer a prospect calls, and so your website is where you need to convince prospective clients swiftly and decisively that you can inspire their confidence. First, demonstrate your capabilities through the use of a case study. Describe the case, then explain how the case panned out and how you solved your client’s problem. Keep the emotional elements in it, because your prospects will be able to relate. Another equally important strategy is to include reviews and testimonials on your website. Make sure any testimonial you feature is one of the more specific reviews you have. Any testimonial that goes into the details of the type of case you solved or how you did it will be best. 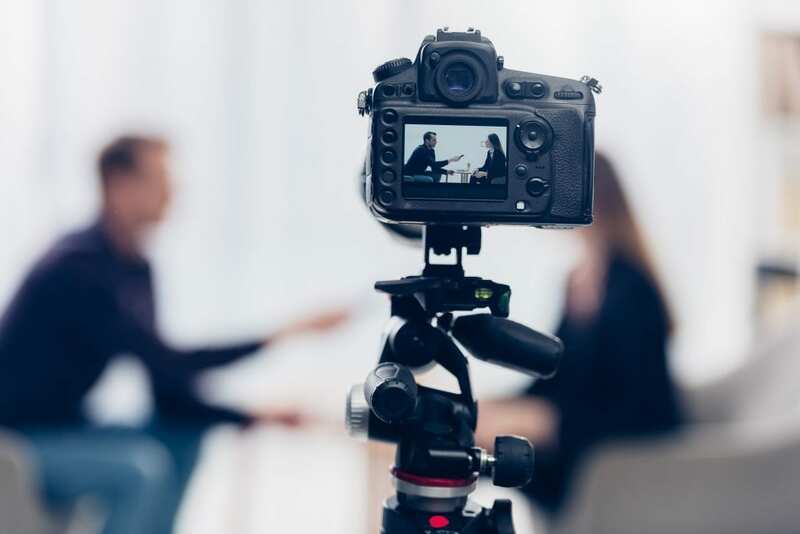 For lawyers whose state Bar associations forbid the use of case studies or testimonials in marketing, there is an ethical work-around. Talk to your Chicago web design agency about installing review site badges on to your website that link to your online directory profiles. The badge on your site will update automatically to show your rating and number of reviews, and consumers know they can click on these to read more about your track record. With these elements in place on your website, it will be well on its way to getting the ready-to-call audience of prospects to call you. There are those website visitors discussed above who are ready to talk to an attorney, and there are prospective clients who aren’t there yet. The second group is your biggest audience, accounting for two-thirds of the prospects to visit your site. And sure, these prospective clients will like seeing your case study. They will like seeing reviews and a list of problems you solve. But that’s not all they want. This second audience comes to your website because they have questions. They’re in the midst of an investigation of the options and outcomes of their case, trying to understand the scope of the legal problem they face. And they want that information before they talk to an attorney. At what age can a child decide where to live? Remember that list of questions you used for YouTube? Now is the time to take that same list and answer those questions on your website. Thanks to that list, this step half is done. Now you just have to answer those same questions in blogs. But answer them well—no wishy-washy half-baked blurbs, or prospects will navigate back to Google to find their answers elsewhere. Did you know blogs are 63% more likely to influence consumers than magazines? So, you’ve answered these prospective clients’ questions. You’ve shown you know your stuff. You’ve even cross-linked from one answer to another to help them navigate the common questions you know come next. Based on the questions these prospective clients are asking, you know exactly what kind of problem they’re facing. The next and final step is to convert, but how will they remember you or your website URL when they’re finally ready to call? To stay top of mind, create a downloadable resource these prospects can use. 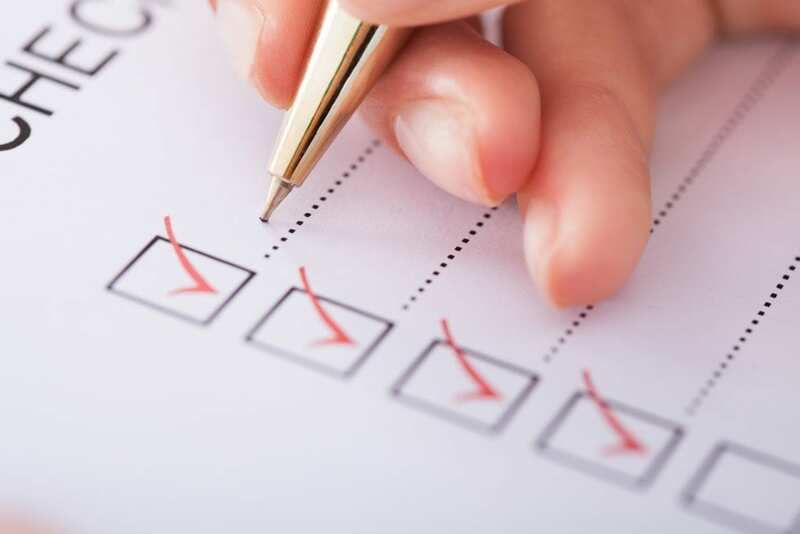 If they’ve landed on your page answering, “do I need a divorce attorney,” then think about a checklist or whitepaper that could help them understand and weigh the details of their situation. Once you have that resource (or “lead magnet”), you load it to your blog. You include it on each blog page for every question where that resource could be useful to the prospect. And then, when your future-clients click to download, you ask for their names and email addresses in return. Once you have those email addresses, you then have your digital marketing agency set up an auto-responder on your website to send more helpful information to this audience over time. Imagine an email once a week, nothing salesy, just a link to another video or another blog where you answer a related question. It’s incredible to us that lawyers aren’t doing this. 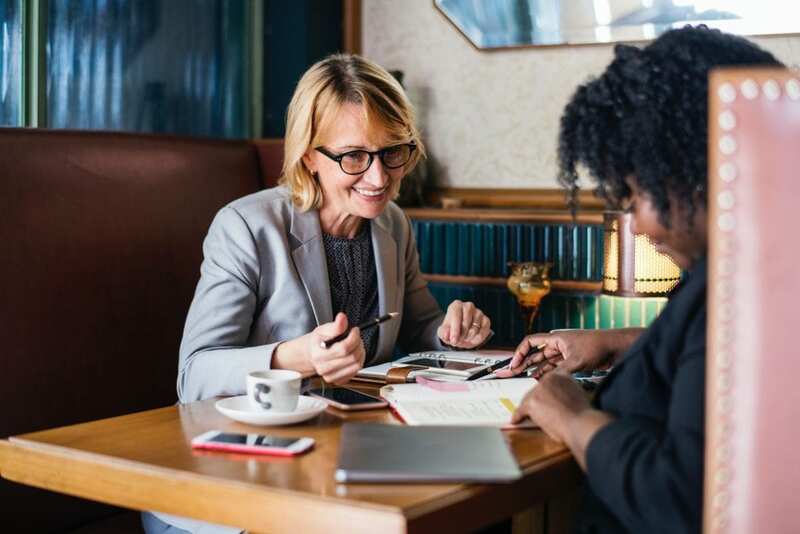 Your prospective clients are those grappling to get a better handle on their problem because before getting ready to call an attorney they need to feel confident about their options and about an attorney’s knowledge. By being where prospective clients are and giving them what they need automatically, you’re bonding with them before they even pick up the phone. Creating a machine to predictably garner more family law and divorce clients is tricky because their legal problems require research on top of personal reflection through some painful problems. In these often-sticky situations, the last thing your prospects ever wanted to do was hire an attorney for this reason. But where hearts may be breaking and fires flaring, you can offer something your competition hasn’t been bothered to do: Instead of selling your accolades and dramatic photos in front of the legal library, you can meet prospective clients where they are—with real guidance in-hand. In the world of digital marketing for lawyers, you can even do all of this on an automated basis. Download our client-attraction-machine checklist ( How to Turn a Law Firm Website into a Client Attraction Machine) or call us to get started today.